The project that changed my life started in the year 1986. This project involved directly the villages in our rural area in the north, helping these villagers to gain more income and by doing so we had helped our country get rid of a huge amount of water hyacinth that clogged up our waterways. Women’s World Banking Association in Thailand (WWB) contacted me to design handicraft product making use of water hyacinth around Kwan Phayao in Phayao Province. It took two years to finish the project, which involved training many villages to collect, dry and plait the dried stalks into usable material, ready to make a prototype for WWB to do marketing. After the WWB exhibition, I decided to join with Suwan Kongkhunthian, my designer’s friend, in forming a company called Yothaka International, to make water hyacinth furniture in 1989 and Ayodhyatrade, in 1994, to make water hyacinth home decorative product. In the years 2014 to 2016, I was in charge of Isaan Objects, a rural development project in northeastern part of Thailand (Isaan), funded by the Office of Product Value Promotion, Department of International Trade Promotion at the Ministry of Commerce (DITP) to develop home decorative products with two other designers from Atelier Pichita, for fashion, Trimode for fashion accessories, then to exhibit all products in Maison Objet, an International trade fair in Paris. Isaan (or Isan) is in the northeastern region of Thailand with 20 provinces, bordering Laos and Cambodia. Even though its environment is not rich, they grow rice for household consumption or drought resistant crops such as maize, cassava, sugarcane and jute. In the old days, they built their houses on stilts that hosted activities, such as weaving or storing agricultural equipment. Each village weaves their own cloth, makes their own baskets for their household use, and in their spare time, they produce more for sale in the market. I travelled over 1,000 miles to visit more than ten groups in five provinces from Isan. I was seeking a group of artisans who can work with us producing in 20 new products in each year. Baanphrachan group, Baanhangmai group and Baantoomthong group are three groups that I like to mention here. The Baanphrachan group in Tambon Ban Fan, Kaset Wisai District, Roi-Et Province, consists of 55 women age over 50 who produce kratib for their household use and for sale. Kratib is a food container long used for packing glutinous rice. This tubular shape container is made from natural fiber such as bamboo or reed (kok), material found around their houses or their rice field. Each kratib artisan from different villages has their own tradition design and their own technique. Baanphrachan uses a sewing reed technique that is similar to African basketry work. Another material that interested me is silk. Silk has been part of Thai culture for several hundred years. 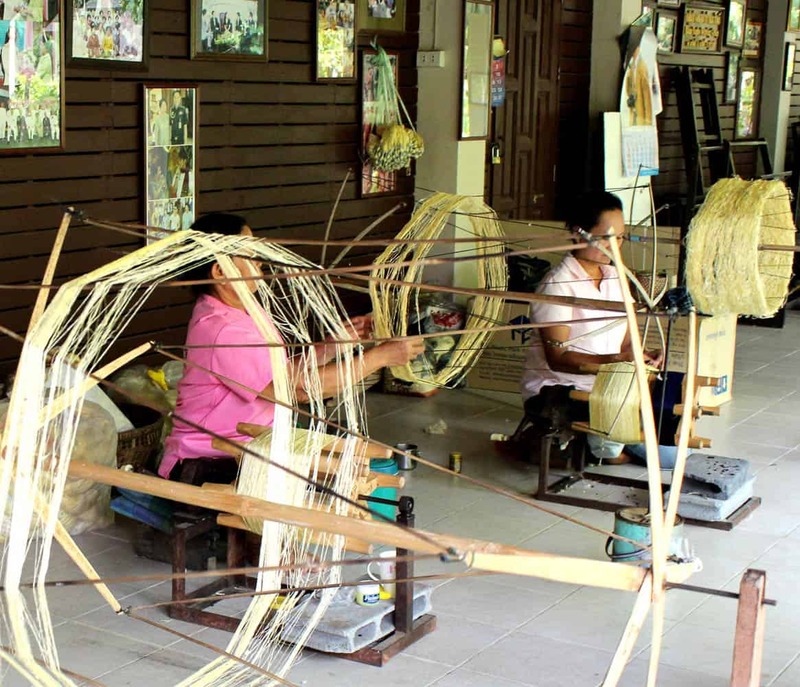 The most famous Thai silk material mainly comes from places in Isan such as Khonkaen, Chaiyaphum, Nakon Ratchasima, Burirum, Roi-Et and Surin Provinces. The majority of most silk thread is still hand-reeled and hand woven using a traditional hand-operated loom. Their pattern and technique vary according to each local culture and wisdom, such as mudmee or ikat technique from northern part of Isan and kit or jok continuous supplementary weave from central and southern part of Isan. I found Baanhangmai group and Baantoomhong group were two silk weaver communities among hundreds of silk weaver communities in Isan that I like to work with. 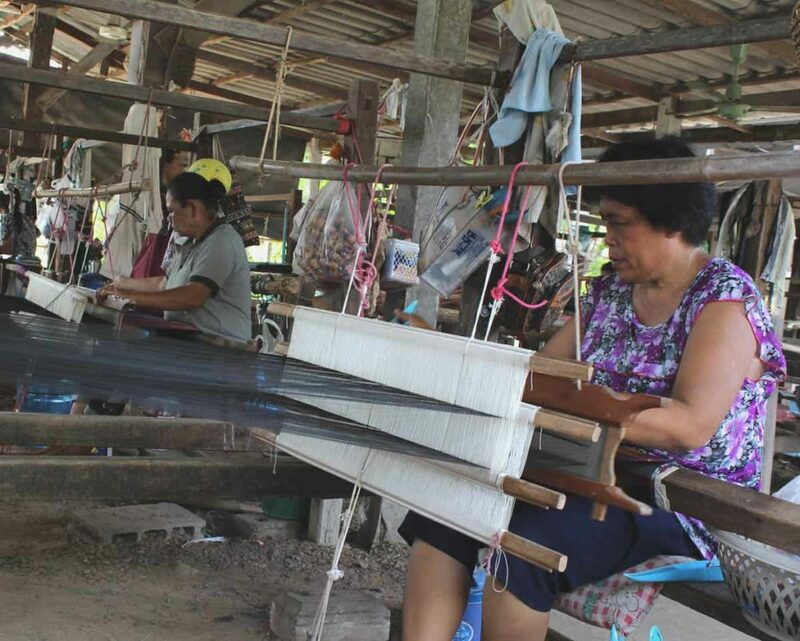 The Baantoomthong group in Tambon Ban Na pho, Ban Na pho District, Buriram Province, is a well established silk weaving community that started with 16 members to 900 members from 17 communities around Ban Na pho District. It is led by the famous Mrs.Sangduan Channuan, who won many national awards for her silk ikat weaving in both traditional and contemporary styles. Baanhangmai group in Tambon Mueang Pak, Pakthong Chai District, Nakhon Ratchasima Province, which used to be called Sumon Thai Silk. It was operated by Mr.Samat Kumsuwan, Bachelor Degree in Architecture, who came back to help his mother who own Sumon Thai Silk, a silk weaving group in Pakthong Chai District, Nakhon Ratchasima Province. 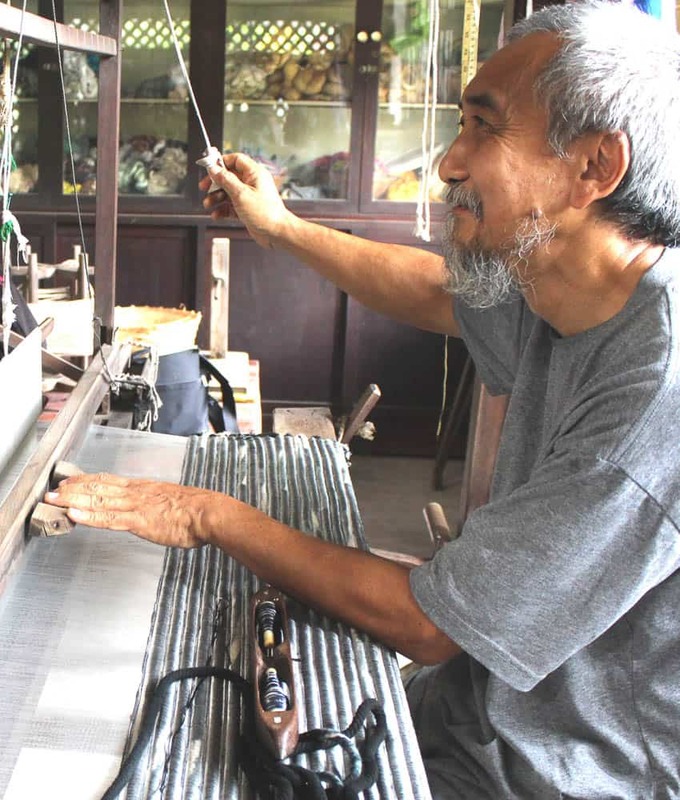 His avant-garde work for silk ikat wall hanging that depicted Isan way of life was exhibited in Japan and was published in many of Thai and Japanese textile magazines. Both groups were made it easier for me to apply my design for the exhibition. My task was to design and use my export experience from Ayodhya brand to help these cottage industries face many disadvantages when attempting to compete with highly competitive international market. I and my team worked hard to come up with Kok Wall Art and Silk Pouf for the Maison Object Exhibition in 2014 and 2015. 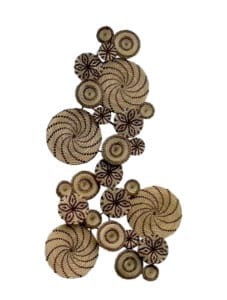 Kok Wall Art, from Baanphrachan group, is a combination of 25 round pieces of Kok with four different designs and sizes, using hand-craft work to make an art piece instead of usual household product. Silk Pouf is a marriage between Baantoomthong group and Baanhangmai group. 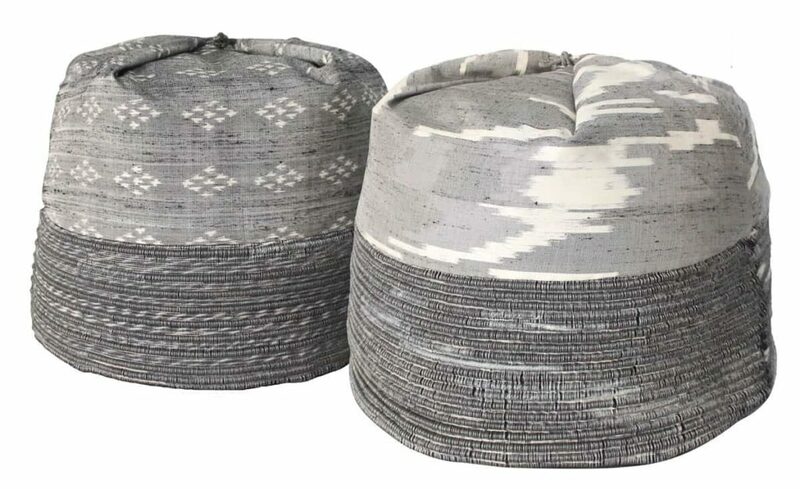 The design combines 4-ply silk Mudmee (Ikat) material from Baantumthong for the top part and silk warp with thick cotton Ikat weft woven material from Baanhangmai to make thick and durable bottom part for this Silk Pouf. The outcome of these two pieces was very positive. Kok Wall Art was in the house of the art director for a very famous furniture company in France and Silk Pouf was in museum curator’s shop in Paris. Since 2014 to 2016, Isaan Objects created more than 160 design products from three design companies that had been exhibited both in Paris and Bangkok. The business models funded by DITP had encouraged more than 30 artisan groups around Isan to produce more new products and all can earn a better living right at home. I hope that this project not only changes some of the villagers lives, but mine as well. M.L.Pawinee (Sukhasvasti) Santisiri is a Thai Designer who lives and work in Bangkok. She is founder of Sahacha (1993) Co.,Ltd., an interior and architectural design firm, Ayodhyatrade (93) Co., Ltd., design and manufacturing and export home accessories made from water hyacinth and other eco-friendly materials, since 1994 and co-founded Yothaka International Co., Ltd., design and manufacturing and export furniture made from water hyacinth etc., since 1989. Upcoming projects include Furniture Décor & Lifestyle exhibition at ITFF’ 2017 Bangkok, Thailand (March 8-12, 2017) www.thailandfurniturefair.com and T-Style Isaan Object exhibition at MAISON & Objet PARIS (September 8-16, 2017).